We are raising funds for a 1-year-old Nishima who born with life-threatening disease Tetralogy of Fallot. She is struggling since the day she came to this earth. Her biological father was handicapped and unable to raise her due to ill financial condition, then Allahuddin adopted her. He already has 2 sons and working as a laborer in fields. 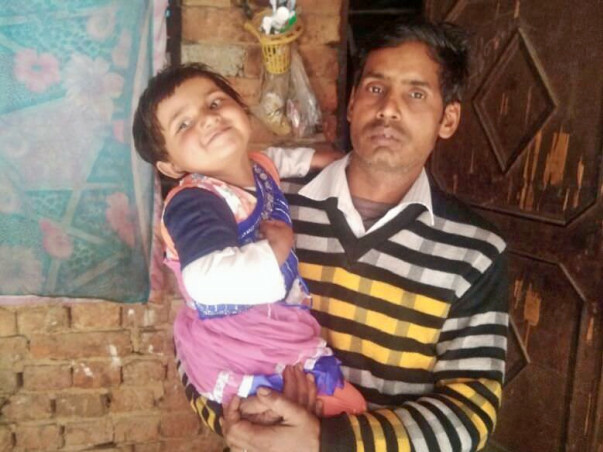 His financial condition was also poor but he always wanted to have a daughter and when he came to know about Nishima's birth and her father's reaction towards her he immediately went to her home and expressed his willingness to adopt her. He said " My family was completed after Nishima, she filled our life with joy, my whole family loves her and we treat her like a little angel. But with each passing day, she was turning blue and sweats a lot while taking feeding. She sometimes cries for about 6 hours continuously. 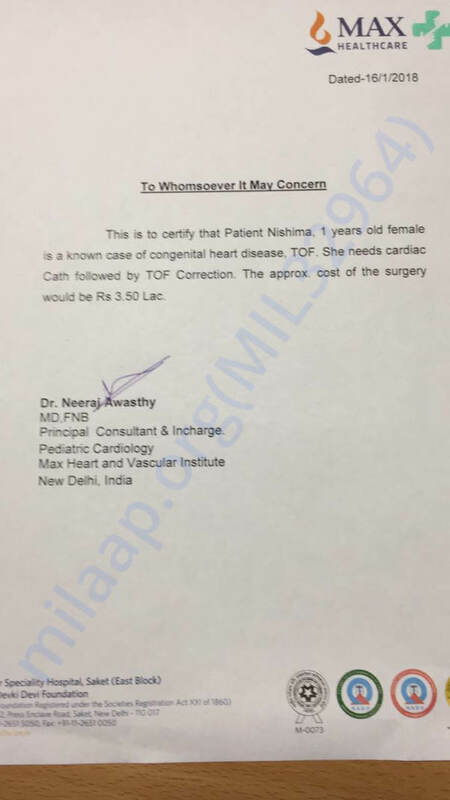 We rushed to doctor to find out the cause, doctor evaluated her and told us the bitter truth that she born with life-threatening heart condition, she needs urgent heart surgery, as per doctor, without treatment her condition can cause her brain damage, or she can even die"
The family is in need of 3.5 lacs for treatment of Nishima. The family needs our support to save their daughter. The family even went to AIIMS but due to long waiting queue, she got the surgery date of 2024. As per doctor she won't survive till then without surgery. Allauddin showed his remarkable gesture towards the girl child. Even though his financial condition was not so good. He accepted Nishima with open arms. Please don't think twice, every penny is countable as it will help us to give life to Nishima and support to Allaudin to enjoy his fatherhood. Thank you for the wonderful support that you have shown towards Nishima. Based on her health and the reports the doctors have suggested that she will be admitted today to the hospital. All the funds raised via this campaign have been transferred to the hospital account to meet the requirement of funds for the next few days. Thank you for the wonderful support. Please do pray for the procedure to be a success. Will keep you posted. It gives us relief in informing you all that Nishima is now fit to undergo the surgery. The doctors are yet to schedule the same and she will be undergoing the operation post Eid. Nishima is at home now and will be hospitalized at the time of her surgery. We shall keep you posted on further developments. Also, we will be withdrawing funds to pay for her treatment. Thank you all the compassionate contribution to support Nishima, we are glad to inform you that Nishima is scheduled for surgery this week. Please wish her the quick recovery.